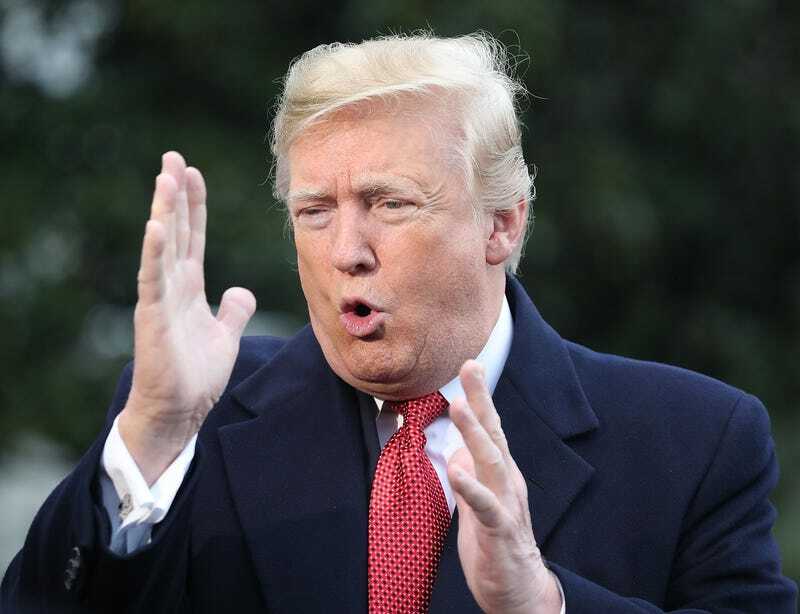 Currently, the Doomsday Clock is set to two minutes to midnight, the highest risk the world has seen since 1953 when both the US and Soviet Union tested nuclear weapons within six months of each other. Originally, the clock was all about the threat of a nuclear apocalypse. Now, threats also include people who ignore the science around climate change, terrorism, nuclear proliferation and idiotic world leaders. Why do I mention this? Well, one reason. If Fallout 76 is indicative of the world I’ll wake up to, I want to stay in cryosleep another 179 years. Why 179 years? Fallout 76 is set in 2102, just 25 years after the bombs fell. 2281 is during the events of New Vegas so I’d be happy to wake up around then and take a trip to the city of sin. The problem with waking up too early is that you have to scrounge and rebuild yourself, there’s a lot more radiation around and too much radiation gives the risk of sterility. Sterile is the key word. It’s by far the most descriptive word to use when describing Fallout 76 and its representation of West Virginia. In Fallout lore, people survived The Great War even without being inside the vaults. This can’t be questioned, although I’ve had a few debates with people who want to be generous to Fallout 76, trying to explain the utter lack of life. The Brotherhood of Steel was formed by non-vault dwelling army survivors in 2077. Characters like Raul, Randall Clark and even Carol all show people who survived The Great War (to varying degrees of success, Carol has become a ghoul). My point is that people survived the bombs in one way or another. The best way was simply to not be in a place the bombs would hit – away from any significant military or civilian target. Fallout 76 actually shows that this was also achieved but in the 25 years between the bombs being dropped and the game, everybody – and I literally mean everybody – died. Maybe even Tsutomu Yamaguchi. So why have I just gone on for two paragraphs about Fallout lore and the survival of The Great War? Two reasons. The first is to quash any further debates that anybody may like to throw at me when I give the second reason. That reason is that these people, the survivors, are part of the reason that the Fallout games have been so endearing. They bring life and community to an otherwise desolate world. This life is also the reason why you do what you do. Sometimes you act in order to right a wrong, or maybe wrong a right. Sometimes you do it just to be a good guy and help somebody who is down on their luck. Sometimes you do everything just to show how ruthless you are and that everybody else is beneath you. Either way, you have somebody to talk to, somebody who comments on your actions, someone who offers context to the world and the actions of the people within. Raiders, survivors, even the Ghouls of Underworld. Other human beings are by no means a suitable replacement for these NPC’s, no matter how deep in the uncanny valley they were. They added an emotional context. These characters cared about each other and on occasion, you even cared about them. There’s no drama in Fallout 76 – Let me break off now and say that there will be a few spoilers until you see the next screenshot. Even a quest where you’re on the hunt for a missing child – given to you by a robot and of course the child is dead – has no emotion behind it. This leads right into the very next issue with Fallout 76. The quests, for the very most part, lack no real purpose or give you an urge to carry on. Apart from a few select quest chains that give the false impression that you may actually meet another living creature. For example, the core chain of following the journey of Vault 76’s Overseer or the multi-part chain that finally has you meet Rose, the raider. The raider who happens to be a Mr(s) Handy with a strange personality. Still, a robot nonetheless. The problem is that everything is told through incredibly long monologues on holotapes or through a myriad of computer documents or notes so wordy that even Tolstoy is looking for advice. It reeks of overcompensation and that Bethesda knew there were going to be issues with a lack of humanity. Another core issue with the quest system is just how immersion breaking it can be. Wander into an area, without cause a quest will pop up. Not even a robot gave it to you. Complete the quest, rewards will literally fall from the ether. The least Bethesda could have done is have a pre-recorded message that took control over your radio to give you the quest. No, instead the hand of god typed it into your Pip-Boy. Also, one thing I want to complain about is the in-game economy. It is downright atrocious. Yes, you can gain caps from quests or looting, but selling on is pointless. There are traders, but they have such a small amount to buy with, you’re nearly always going to struggle. Also, If you buy something for 200 caps, you would expect the trader to then have 200 caps to use to buy from you. No. They somehow only have 15. The Appalachian VAT is extortionate. 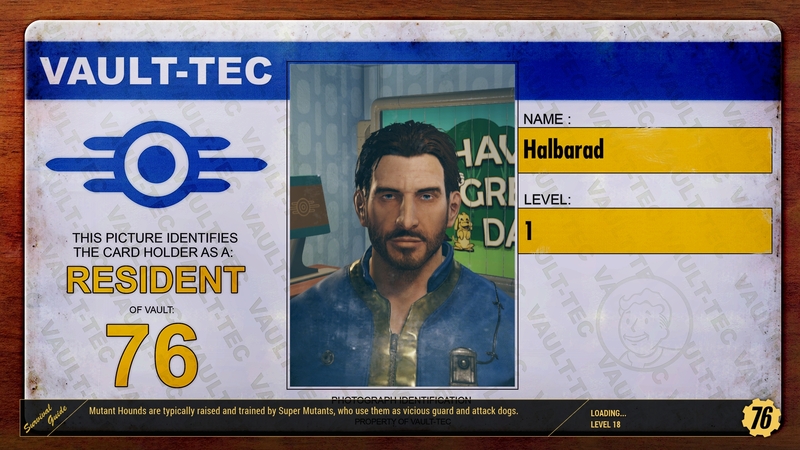 One thing that Fallout 76 does get right is character creation and development. It’s very easy in other Fallout titles to become incredibly overpowered and, as a result, take any true difficulty from the game. Naturally, when it comes to exploration following the completion of the core story it makes it a lot easier. Only very specific monsters scaled with you. This is all but removed with different regions of Appalachia feature creatures of varying levels – more on this later. Character development here takes a whole new form. It’s plainly designed to suit the new online mode, with perks being given in card form. Each time you level up, you can select one card. Every fifth level, you receive a pack of cards and a joke. What makes me most grateful is that the punchline of the joke isn’t the consumer. You can’t buy these packs. Bethesda hasn’t gone the loot box route like EA and Activision. These cards gain levels as you collect more of them, each having a maximum level. Some are simply one and one, with the most I’ve seen is three cards to max out the ability. The way it works is that the perks are linked to particular attributes. For example, the Good Doggy perk – the most useful in the game for me – only requires one endurance slot. 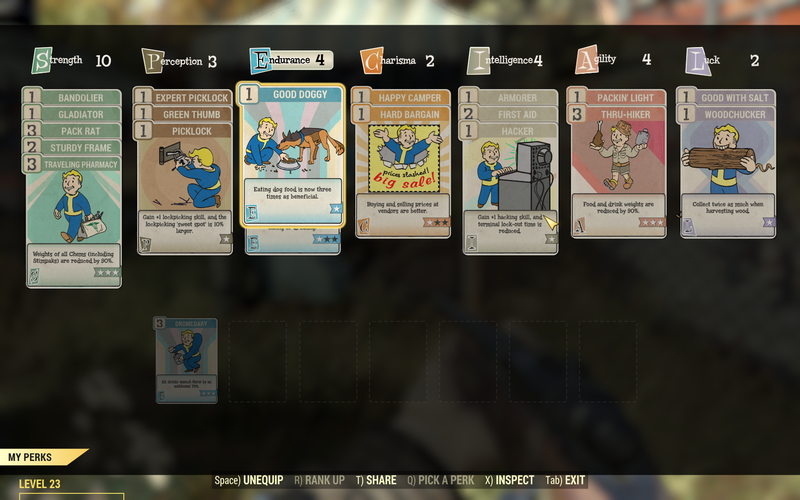 Travelling Pharmacy, which lowers the weight of Stimpaks, chems and other aid items, can be maxed out and use three slots. The best part is that you can swap in and out these perks whenever you like, letting you try out perks you likely never used in the single player games. It’s genuinely the most rewarding and engaging system the modern Fallout games have had. Another area where Bethesda got it right is just how nice West Virginia is to explore. You’ll find it considerably more rewarding to outright ignore quests and wander out on your own. The compass, highlighting the outlines of a nearby point of interest which pops into view when you get close enough. 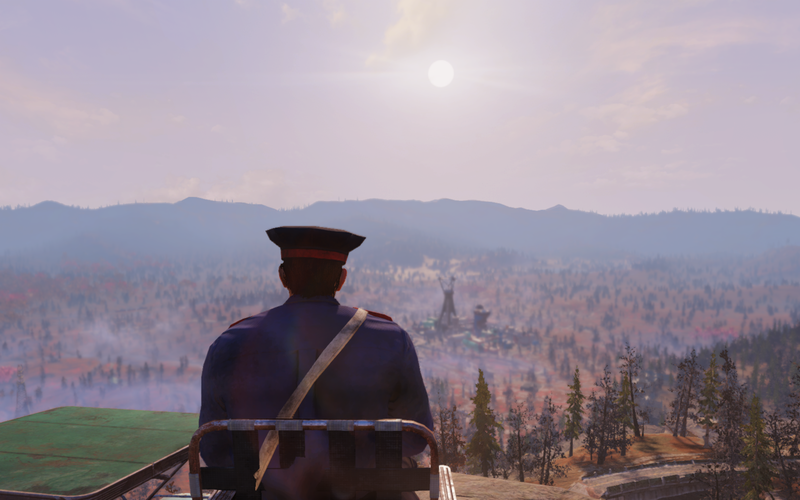 Some of the views are downright fantastic as well because, much like real-life West-Virginia, there’s a lot to see and a lot of vantage points to see it from. One thing to note is that this map is more akin to what you can find in Forza Horizon 4. The locations are real, or based on something real, but not in any way indicative of their real-life locations. In-game, for example, Grafton is north of Morgantown. In real life, Grafton is to the south and the nature reserve (lake) is south of Grafton, not north. It’s a variation that’s easy to accept because it really works for the game and the land is extremely well crafted and full of locations to visit. It’s the wandering, seeing some surprisingly spectacular scenery (considering the ageing engine and how distinctly average everything looks up close) that makes the game for me. It’s seemingly the largest map Bethesda have made and by far the most diverse in the Fallout franchise. From the lush forests of The Forest to the bright reds of Cranberry Bog, even the bright whites of Toxic Valley, an area plagued by toxic waste, there’s a lot to see. It’s a pleasure to explore and make your own path through the hills and mountains. All of this exploration is, of course, backed up by a fantastic soundtrack. It’s a Fallout staple to have classic songs, from the likes of The Ink Spots, Bing Crosby, The Beach Boys, The Beatles and so many more. Video games, particularly Fallout and Bioshock, have introduced me to older music that I absolutely love. Fallout 76 carries on this tradition with the most extensive soundtrack of the series yet, with some great audio design throughout the rest of the game. Monsters sound fierce, guns powerful and the game offers some excellently atmospheric ambience for you to settle down and listen to. It’s this settling down with the C.A.M.P. system (Construction and Assembly Mobile Platform) that is probably the most appealing aspect in the game for me. I enjoyed building settlements in Fallout 4 and was really looking forward to it here in 76. Sadly, this has been hamstrung by smaller build limits and limited storage capacity. Everything you build, as well as the weapons, armour and items you create and modify, are done using components from junk. The problem is your stash is currently limited to a very small number. This is something Bethesda has said they’re going to fix. I can actually understand that there’s a smaller build limit. Naturally, with 24 players per game, allowing each person to build their own castle wouldn’t be feasible. It’s not a case of the world being large enough, it is. It’s more the fact that the game has to load everything. Knowing the issue the game already has with loading things, I’ve had robot vendors take over thirty seconds to load and seen built items merging into one another, it would probably be too much for the engine to support even more. Particularly so when the building element expands to more than the C.A.M.P.s. A variety of areas in the game feature capturable points which then make the place buildable, offering considerably more land to build on. In addition to this, these areas also offer special bonuses. For example, one factory you can capture allows you to provide power to a food processor which will then supply you with food. These areas all in addition to any personal house you may have built. Also, these have quests related to them, tasking you to capture and defend them, as well as other specific quests such as the aforementioned turning on of the food processor. This is also where the real-money transactions come forward. 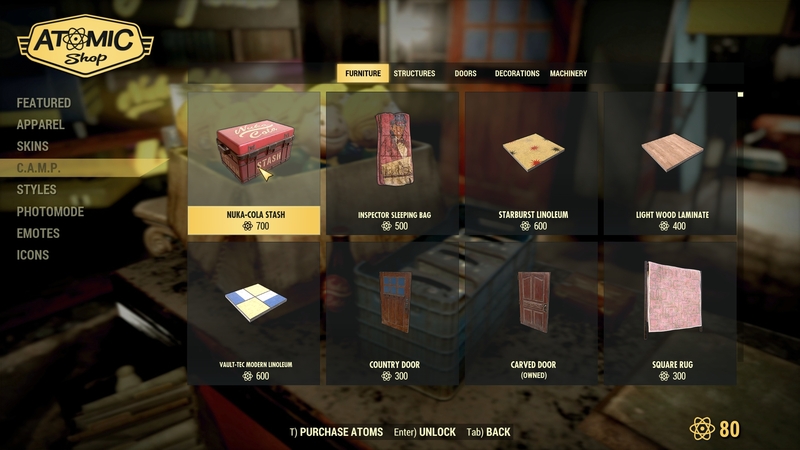 You buy in-game items using Atoms, the in-game premium currency. 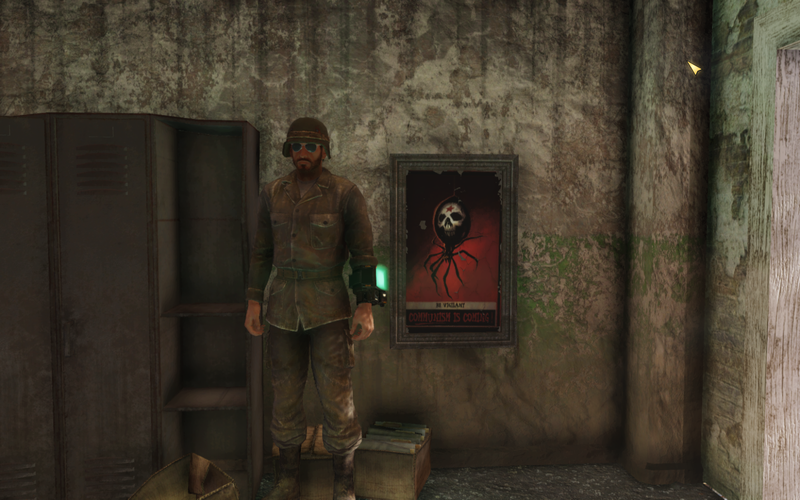 These items range from aesthetic items like skins, emotes and frames for you to use when you take photos, to usable items when building with your C.A.M.P. and these items are, for the most part, cosmetic variations of functional items or purely cosmetic items. The only truly functional items I’ve noticed were a small generator and a water purifier. I’ve literally spent zero real money on Atoms because the game is actually fairly generous with them, through milestone quests and rewards for daily quests. Worth noting is that each and every time you log onto a world, it’s going to be a different one. Your personal building will travel with you to each new world unless you just so happen to have built around the same location as another person who is currently logged in. All of the other locations, the structures you have built remain but it’s there, ready to supply the next person who captures the area. It’s a surprisingly good system that can truly benefit you if you happen to drop lucky on a pre-built area. Or simply take one off of another player – the real PVP of Fallout 76. Honestly, aside from me being attacked by players when I’ve accidentally obtained a bounty because I stole from the captured location of another player – you have to actually enter the map to see if an area has been captured by somebody – I haven’t actually encountered much in the form of PVP. I’ve been killed by other players 9 times, I’ve killed other players 4 times. I’ve spent more time actually working with other players, although this has also been few and far between. Working with other players is certainly useful, although only actually for taking down high-end and difficult monsters. I should make it clear that I mean random players there, with friends, this next part may not really apply. Why only for that? Because the game outright punishes you when teaming up on quests. Everybody has to interact separately with a device, which is perfectly fine. On the few occasions I’ve teamed up with people on quests, not a single one of them explored the lore, they simply ran ahead. I was playing catchup because I actually bothered to read things. 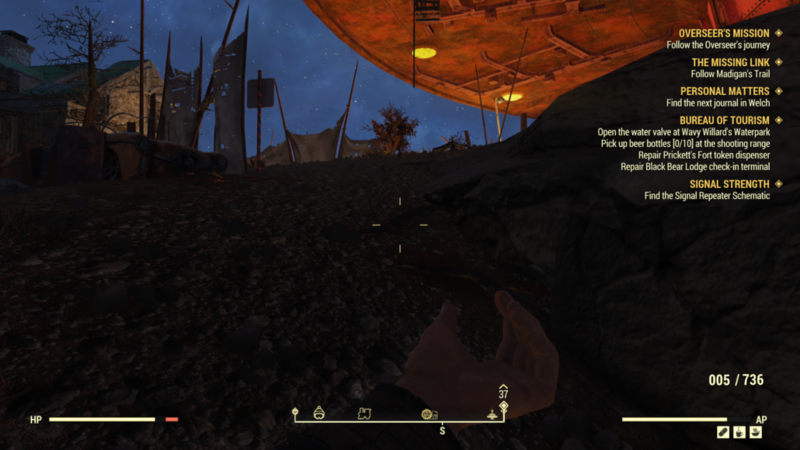 It’s a core issue that can occur in any multiplayer game, so I can’t hold it against Fallout 76. It was a benefit later on though, once I got bored of the dull and lifeless world, actually chatting with other players and talking while we moved from point to point on the quests with no meaning (all of them), it filled in at least part of the void, the sterility of West Virginia. Finally, we have an area that Bethesda is known for. I genuinely believe Fallout 76 needs to go to the GUM clinic because it’s got a case of every single STD bug known to man, possibly some only known to Radroaches. The game is absolutely littered with bugs and glitches. Every single session rears up a repeat of existing bugs that haven’t been fixed, even with recent patches, or ones that I hadn’t yet seen. Not to mention just how damn slow the game can be when loading anything, even something as simple as opening the map. Some of these issues range from the endearingly simple, to annoying or even downright game breaking. The endearing bugs are physics related. Bodies, once killed, will flail around manically. I’ve seen creatures floating in the air, alive, but seemingly in another dimension, oblivious to all around them. I couldn’t even shoot them. I’ve also had invisible enemies and others literally chasing me across the world. It’s charming, but something that shouldn’t be happening. Other issues are far less charming though. A fair number of holotapes either being blank recordings or the game was angry at me and just refused to play them. Also, I’ve had multiple times where gunfire would constantly repeat itself. At first, I thought it was nearby combat, it wasn’t. It followed me everywhere and constantly repeated for over thirty minutes until I entered a loading screen. Of course, these loading screens are also long, some up to a minute and others eternal. Other issues are questlines that can’t be finished (unless you restart the game) because objects can’t be interacted with. I’ve had computer terminals in the game that wouldn’t load up, not letting me read key notes that would let me continue a chain or simply read some backstory. Sometimes, the game will simply freeze and crash. It does seem that a number of issues have been exacerbated by the move online. The fantastic Ron Perlman famously said “war, war never changes” and the same could be said of the core of Fallout under Bethesda. Until now. Sometimes, change can be for the better but in the case of Fallout 76, this is far from the case. Fallout, under Bethesda, has always been clunky, but enjoyable thanks to engaging storytelling, interesting NPC’s and some fantastic worlds to discover. This, this is the worst game developed by Bethesda Game Studios with the sole exception of IHRA Professional Drag Racing 2005. Why? Fallout 76 and West Virginia are dull and lifeless. Bethesda has taken away the elements that have quite literally saved the Fallout and Elder Scrolls series so far. There are no NPC’s, bar robots and a wandering Super Mutant. Quests have no real engagement to them and can literally shatter immersion. The only true investment to even try and gain is from a selection of holotapes that tell stories that have long since passed. That and, if you’re like me, building your own camp. Even that gets old. All you’re left with is some decently fun multiplayer end-game combat against high-level behemoths and other monstrous creatures after the launch of a nuke. If Bethesda doesn’t do some incredibly good work patching Fallout 76 I can’t see it having a fantastic lifespan. 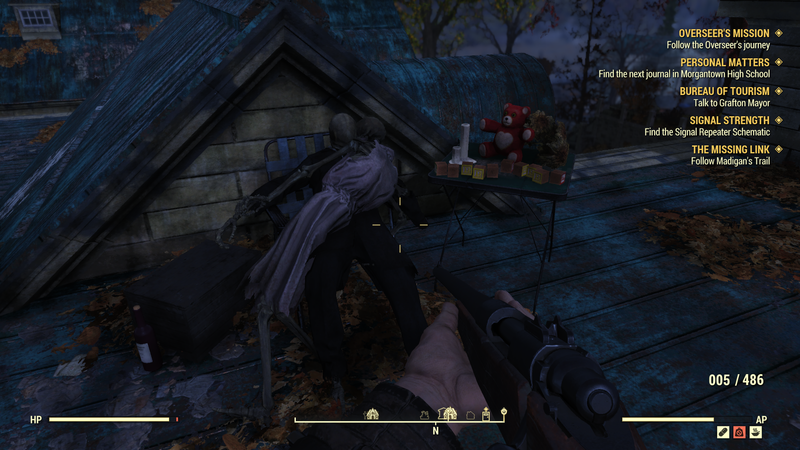 Fallout 76 is immediately hindered. It’s Bethesda’s buggiest game so far, which is saying a lot. Worse than that is the fact that West Virginia, an area that likely would remain somewhat more unscathed from the events of The Great War is dead, where Washington DC, Boston and Las Vegas and surrounding areas still featured survivors and life that weren’t secure in the vaults. Frankly, those that died during and after the bombs, they were the lucky ones. Me? I’m bored. There are only a few clues for the PC version that let you know how long you’ve spent in Appalachia, specifically achievements that reward you with Atoms. I know for a fact that I’ve spent over thirty hours. I’ve tried in vain during this time to reach the point where the game is engaging. I’ve even seen nukes drop. Aside from those few moments, the monotony just dragged on. PC version reviewed. Copy provided by the publisher. You can purchase the game on Amazon. 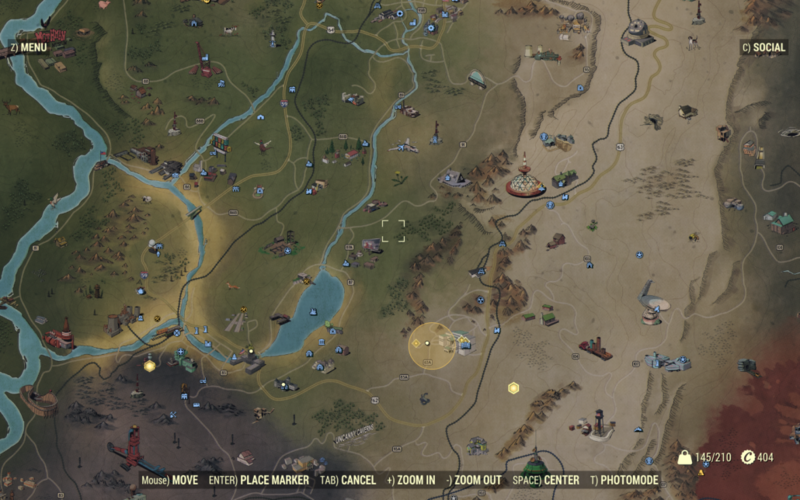 Fallout's most varied and interesting map yet, a pleasure to roam around and explore. A genuinely good looking game when viewing environments from afar. Great audio design (when it doesn't bug out) and a fantastic soundtrack. Excellent character development and perks system that allows for experimentation. Good building system, especially the areas you can capture, control and fight over. Quests are all too similar, often leading to you reading to long notes or listening to long holotapes. The quests have little purpose and actively demolish any sense of immersion as with most they, and the rewards, are seemingly pulled from the ether. While good from afar, close up the visuals are dated, to say the least. In-game economy is downright atrocious. C.A.M.P. storage is far too limited (though this will be changed). While good, the building system can be unintuitive and poorly designed, with parts simply not acting as they should and, at times, merging into each other. By far the buggiest game by Bethesda yet, with a myriad of minor to downright game-breaking issues.